5.0 out of 5 starsEssential reading for the digital age. Impressive work. An impressive run through history, politics, economics and technological progress that explains in simple terms how the new age of digital technologies impacts individuals and societies. The authors proceed to offer ideas and suggestions on how to embrace and steer these exponential impacts that are thought provoking and positively encouraging. I believe this book is a must read for every citizen but importantly our young people. Well done to the authors. Solid and well written. There are better books out there on the detail, but few that provide as concise a summary. Earlier works by the authors were more seminal and valuable. I found it easy to skip through and isolate the points/ kernels of truth that mattered. As such the work is more a good summary than anything new or profound. Is it worth the read: yes. 5.0 out of 5 starsThis is the future, read it here first. This is a book that EVERY business owner, CEO and policy maker needs to read. In The Second Machine Age Erik Brynjolfsson and Andrew McAfee lay the trends that are shaping our relationship with technology. Quite rightly they point to the risks and challenges that increased 'intelligence' and machine capabilities will bring, and in fact is already bringing, to the workplace. I completely agree with their conclusion that as a society we need to learn to race with the machines, it is only through a more intentional and integrated approach to using technology that we will avoid the more dystopian futures that we might otherwise face. This book follows the logical outcomes of the increasingly rapid rising tide of innovative IT driven technology, removing jobs and increasing the wealth of the owners of capital and the fortunate minority with the right skills to be in demand. While average wages have been rising in the USA median wages have been falling. The logic is compelling and so is the predication it will get worse. They do propose some solutions which are unlikely to be headed in the near term but which make sense. I highly recommend reading it. An easy to read discourse that traverses many interesting dimensions of economics, technological advancement , philosophy and human endeavour. As we struggle to understand the current issues we face today in terms of slow economic growth, lack of jobs impacting both working and middle classes and the rapid rise of technologies such as driverless cars and Cloud Computing, the authors provide some thoughtful insights, suggestions and pose some thorny questions that we humans need to address. Very enjoyable!! The must-read in a large category of books about technology and the future. Broad in scope, grounded in economic theory, and ultimately empowering about the choices humanity is facing. Brilliant in every sense. This book is for futurist.after reading this book it inspires you to transform world to make a difference in technology space. Great read. Great content and highly recommend this to any one who wants to make a difference in this world. The main argument: In the first machine age--otherwise known as the Industrial Revolution--we humans managed to build technologies that allowed us to overcome the limitations of muscle power like never before. The result, which has reverberated these past 200 years, has been an increase in economic productivity unprecedented in human history. And the corollary of this increase in productive power has been an increase in material standard of living and social development equally as unprecedented. In the past 30 years, with the rise of computers and other digital technologies, we have moved from overcoming our physical limitations, to overcoming our mental ones. This is the second machine age. Though we are still at the dawn of the second machine age, it already shows at least as much promise in boosting productivity (and quality of life) as the first. Indeed, by various measures--including the standard ones of GDP and corporate profits--we can see that the past 30 years has witnessed an impressive steepening in productivity. And this is just the beginning. For digital technology continues to advance at an exponential pace; more digital information is being produced (and kept) all the time (all of which has enormous economic potential); and new ways of combining existing (and new) ideas into newer and better ones are ever being found. Still, what is equally apparent is that the benefits of this steepening in productivity have gone to the few, rather than the many. Indeed, while the top 20% of earners have seen their pay increase since the early 1980s (and the closer you are to the top the more dramatically your pay has increased), the bottom 80% has actually seen their wealth decrease. And the spread is widening ever more as we go. This is no random, or merely temporary outcome. Indeed, as Brynjolfsson and McAfee demonstrate, the unequal distribution of wealth in the second machine age is a natural corollary of how digital technology works and is used. Specifically, computer technology produces an economy that favors capital over labor; skilled labor over unskilled labor; and superstars (who are able to reach and corner entire global markets) over local players. And not only does computer technology tend to play favorites, thereby increasing inequality. It also steadily erodes human employment outright. For as computer technology advances, more and more jobs that could once be carried out only by humans, becomes possible (and cheaper) for computers to accomplish. Nor is there any guarantee that new innovations and advancements will necessarily produce new jobs as fast as old ones are being lost (as was once thought inevitable). Indeed, we have already seen signs that this simply cannot be counted on. The problem with all this is not just that extreme inequality is a political problem on its own. It's that as more and more people are driven out of the economy, the prospects for greater growth are themselves undermined. 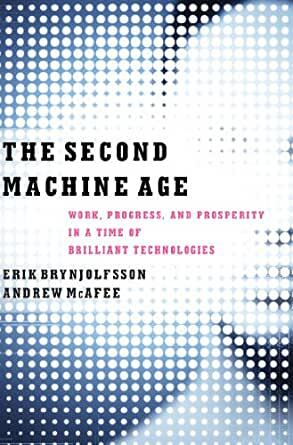 Nevertheless, just as wise policies have helped us overcome many of the problems with the Industrial Revolution, Brynjolfsson and McAfee argue that the same can be done with the problems of the Digital Revolution. Specifically, more can be done to ensure that our education systems are geared to the realities and demands of the second machine age; more can be done to ignite and encourage entrepreneurship, which is needed to replace many of the jobs that will be lost; and more can be done to mitigate the inequality caused by the new technology, such as introducing a negative income tax--which preserves a minimal standard of living for all (and keeps people in the economy as consumers), while encouraging all who can to stay in the workforce. The book is very well-researched, well-written and wisely argued. The authors have taken the facts and the data as they stand, without preconception or political coloring, and have delivered an honest and insightful analysis. Both the bounty and the spread of the second machine age are made apparent, and the proposed approach moving forward is well-measured and judicious. An important book for policy-makers, and the generally curious alike.